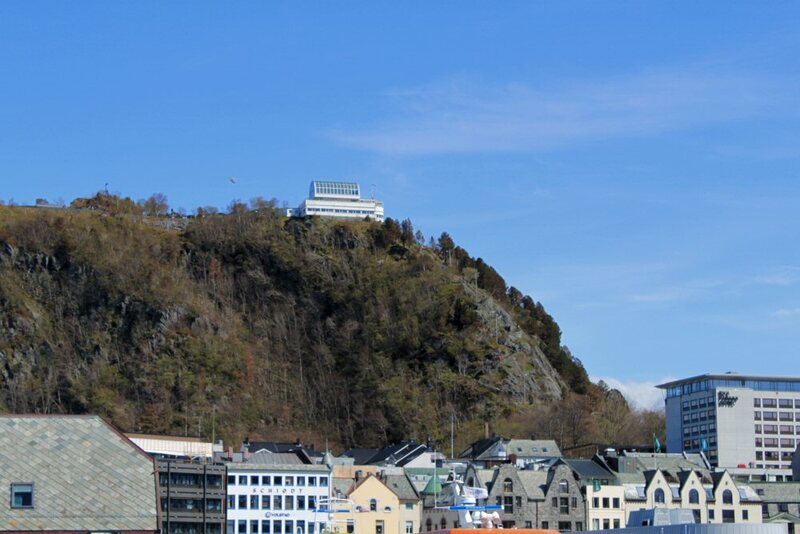 Much to our delight when we entered Alesund's harbor, the sun was shining brightly, a contrast to the misty rain we experienced on our first visit a few years ago. 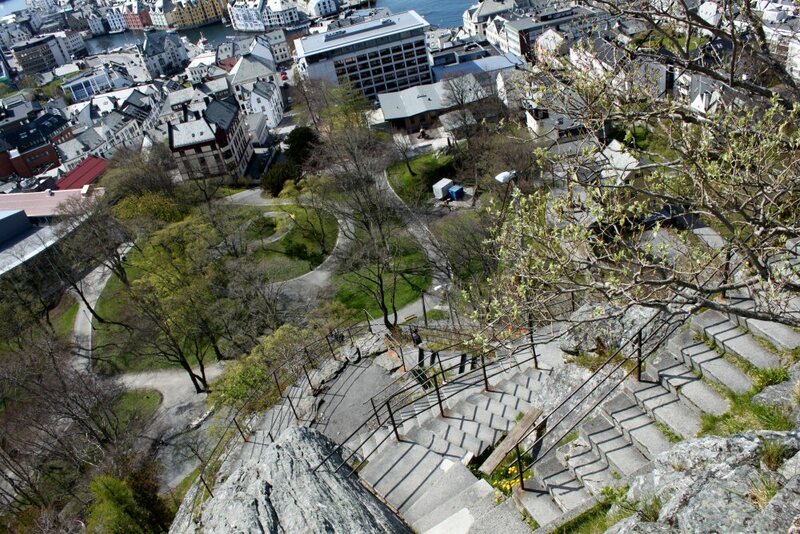 But did this mean we would brave the 418 steps up Askla to Fjellstua where we could enjoy the panoramic view of the city and surrounding countryside? 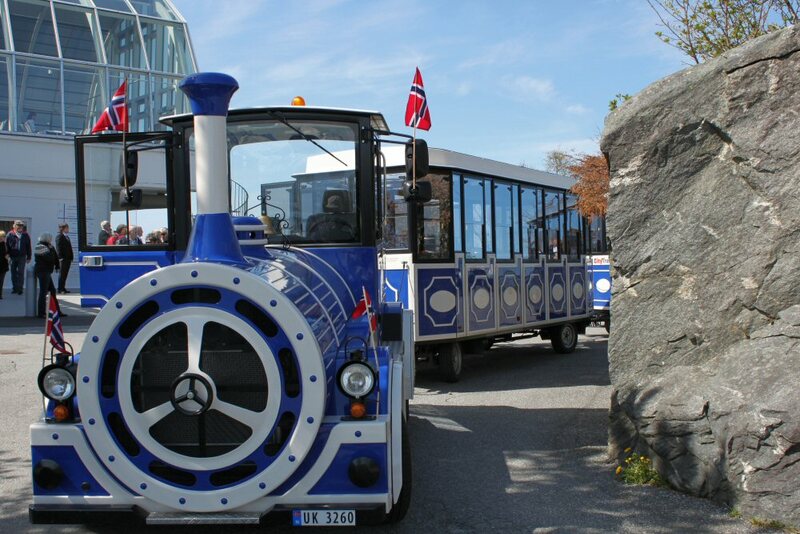 Luckily the city train was waiting on the pier as we left the ship to begin our exploration. The choice was easy. Ride up to the top and walk down. At least this time the steps would be dry. The train looked newer that the one we rode on the last visit and we'd had to walk into town to find it. We appreciated it being there for us this time. Once it was full, it began its trek up Askla with the commentary running in several languages depending upon which one you dialed in with you earphones. At Fjellstua, where there is a cafe and lots of lookout points, we were entranced by the gathering of wedding guests who were congratulating the couple dressed in traditional costume for the nuptials. Once around the building, taking pictures from several vantage points and we were ready for the 418 steps--down. There is a handrail all the way but some of the steps are a bit uneven and some were being repaired. The steps ended in the town park, a nice quiet area prettily landscaped and inviting one to sit and relax a bit. 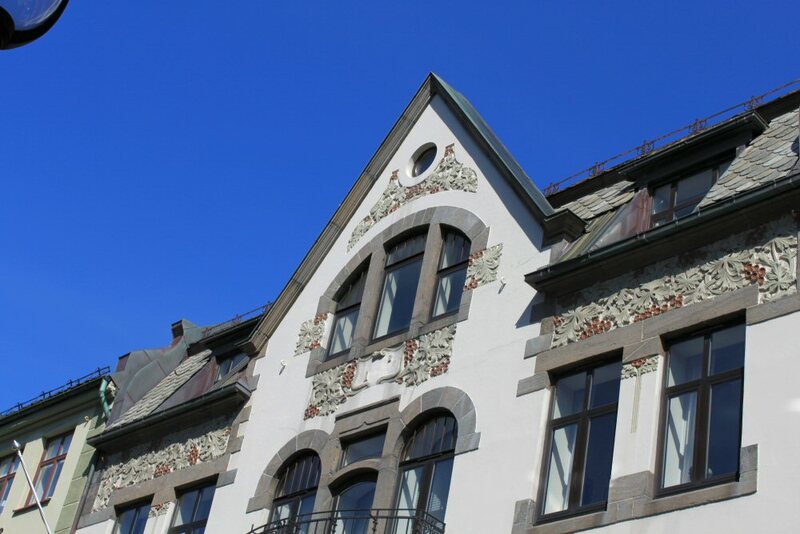 We wandered around the streets of Alesund the rest of the afternoon enjoying the sun, the cool breeze and the beauty of the architecture. In 1904, a fire destroyed many of the buildings in the city. The German Emperor Wilhelm II sent immediate help to the city and in a short time the city rose from the ashes again. There are lots of tributes to Kaiser Wilhelm all over the town center. The architecture is called Jugend style which, if I understand correctly, is a German name for Art Nouveau and obviously a result of the rebuilding assistance given by Germany. Sunset was very late because we were so far north and after dinner, while Bob went off to find free WiFi at McDonald's, I wandered the Promenade Deck and watched it begin to turn the sky into lovely evening colors over the city. 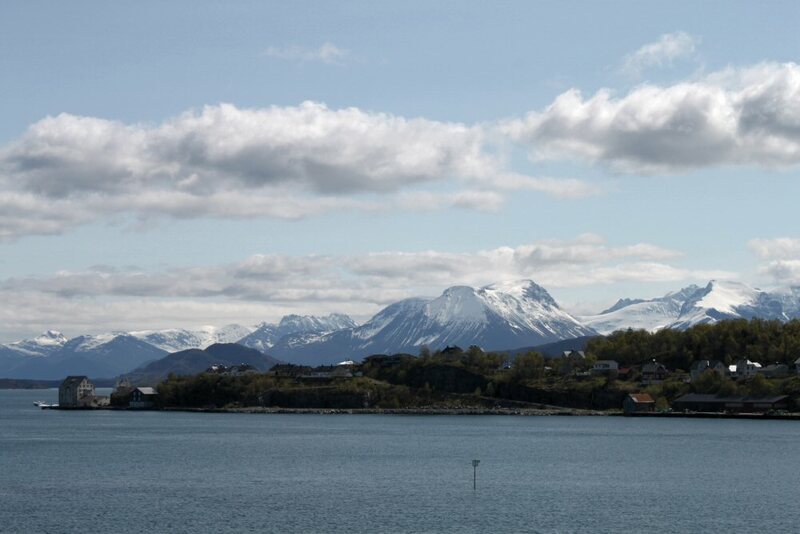 On the other side of the ship, in the distance were the Norwegian alps. The sun's rays played across the snow capped mountains. 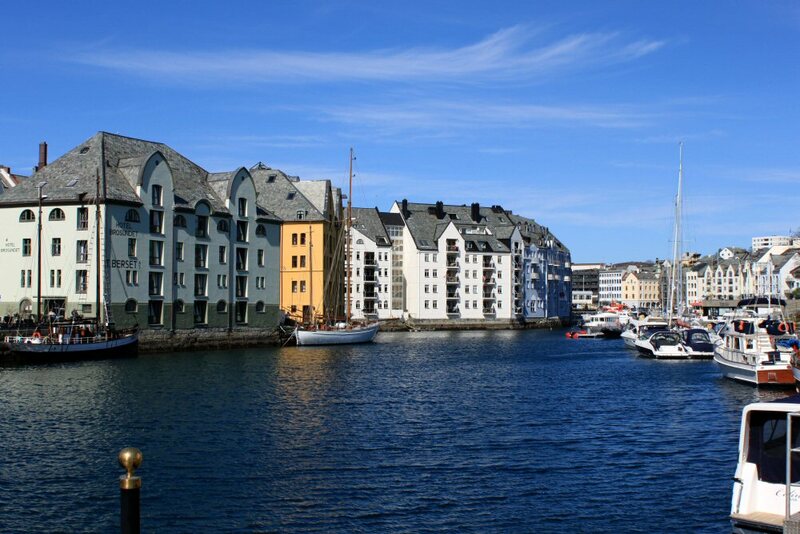 Once again Norway was proving to be a favorite destination--rain or sun. 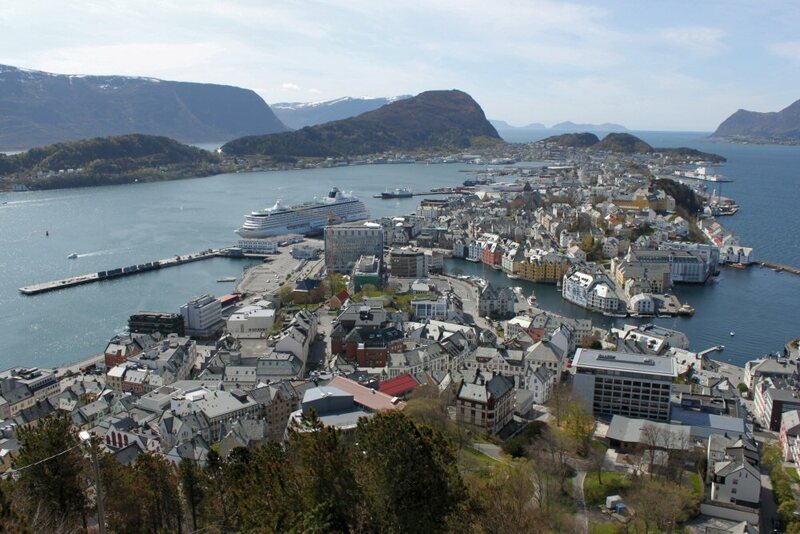 There is much more to Alesund and the surrounding area and just a few hours stop does not do it justice--even when you've stopped there twice. Ah, another place to add to the return list.